Own our own time V is part of La Triennale Internationale des Arts Textiles is a Outaouais 2016 http://triennale-outaouais.com/la-route-des-arts-textiles.html . For one hour 83 participants save an unique hour in form of monumental knitting together. 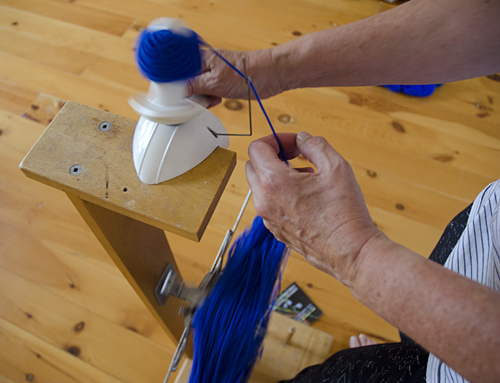 Locally produced yarn is a part of the history. The hour saved in Canada is blue. The yarn from the Canadian factories Briggs and Little in New Brunswick http://www.briggsandlittle.com/ and Fila Tures Lemieux the Quebec http://www.lemieuxspinning.com/en/index.html was prepared before the performance that was carried out August 27. The yarn was donated to the project by Moon Rain Centre.